Years ago I saw a “Godzilla” movie in which Godzilla is trying to teach his son to use the ever-effective flame breath attack. The best Godzilla Jr. can do is to blow smoke rings, at which point Dad makes the universal “face palm” gesture of slapping his forehead with his hand. The Flex-i-File is a very simple but effective sanding tool that has actually been around since 1968. It consists of an aluminum frame in a square U shape with two projecting pins on the ends that hold a strip of sandpaper between them. When used on rounded objects like gun barrels, fuel tanks, turret joints, aircraft fuselages, ship hulls, etc. it flexes with the round object, removes the seams but does not flatten the surface. I have used them since first discovering them over 25 years ago and love the control and ability they provide. 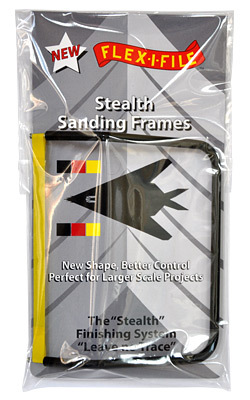 Now Flex-i-File has introduced a new model - the Stealth. This is a black aluminum tool but unlike its straight-armed predecessor has approximately the last one inch bent at a 45 degree angle. What this does is give more “reach” to the tool to permit sanding larger objects. For armor modelers think of something like an M48 or M103 turret and hull and the ability to get a clean sanded joint on the parts. The reason for a set of three is to provide three different sanding grits - 320, 400 and 600 - without having to stop and change strips in mid-work. As this tool takes the same strips used by the regular straight-leg ones it can also be fitted with their 150 and 280 grit strips. Overall there is not enough that I can say about this system and it is one of those “Top Ten Tools I Cannot Model Without” as the surveys usually want to know. But I am still shocked to find out how many do not know about them after more than 45 years in production!